What If I Can Only Pick One Spectrum? PAR vs Lumens: Which is Best to Measure Grow Lights? 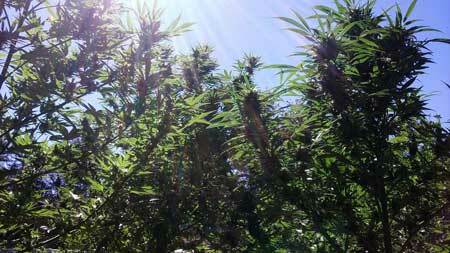 Note: This article is aimed at intermediate to advanced cannabis growers looking for ways to improve their results. So what’s the “best” light spectrum for growing cannabis? Unfortunately that’s a big question since each spectrum has its own unique effects and some are more useful to you than others, but let me share everything we know so you can decide what’s best for your goals and situation. There is no “best” light spectrum for growing cannabis, but you can choose the best one for your goals and grow room! 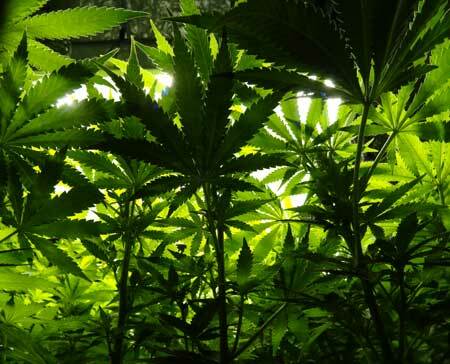 So why do cannabis plants react to the spectrum of light? 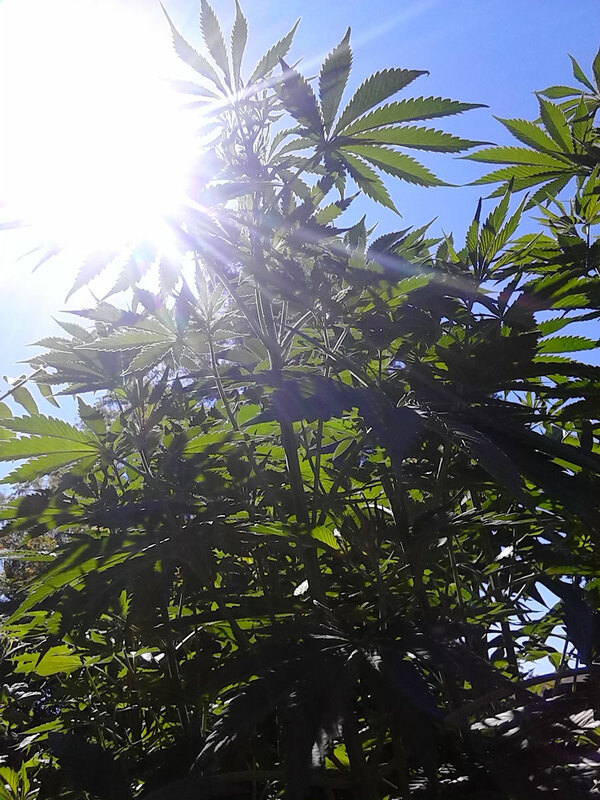 When growing outdoors under the light of the sun, the spectrum of light received actually gives a cannabis plant a lot of information about what’s going on in the world around them. By keeping track of the ratio of colors in the spectrum of light, a cannabis plant is able to “know” a little bit about what’s going on around them which helps plants grow in the best way possible! As an indoor grower, it’s your job to be the sun and tell your plant what to do! If you’re trying to keep plants short with lots of leafy growth, use grow lights that give off light in more of the blue spectrum during the beginning of your plant’s life. When it’s time to switch the plant to the flowering stage, you might switch the lights to something that has more of the reds and oranges that cannabis likes during the flowering stage. But you don’t have to follow the general rules! I personally use an HPS bulb from seed to harvest, which gives off primarily red/yellow, because I like how young plants grow under them – I find it easier to train the plants when they have a little bit more space between nodes! But if I were in a very height-limited space, I might consider trying to give more blue light to help keep stems naturally shorter. I personally grow plants from seed to harvest under HPS grow lights so plants grow taller, because the longer stems make plant training easier in my case. You can grow your cannabis plant from seed to harvest under any grow light as long as the light is bright enough! Although certainly not essential to healthy plant growth it is considered good form to choose lights in the proper light spectrum to encourage the growth you want in the vegetative and flowering stages of the marijuana plant. If you have a tool, why not use it? However, keep in mind that different strains are affected differently by the color spectrum of the light. Some plants are barely affected at all while others might react much more strongly. 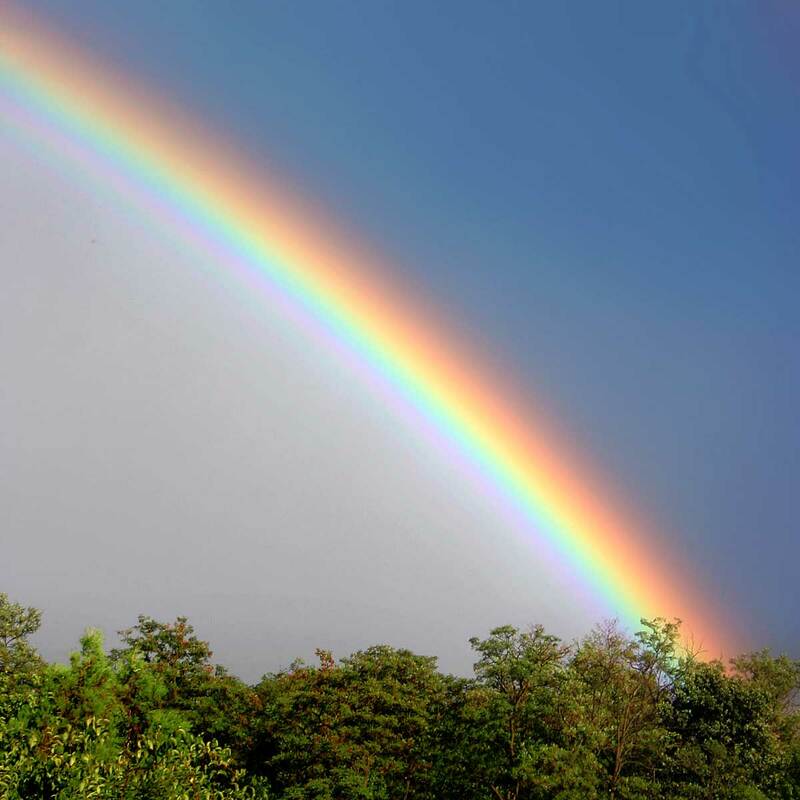 It’s important to remember that the changes caused by light spectrum are relatively small (such as stems tending to grow longer) and many other factors drive some of the same changes. For example, if your plant isn’t getting enough light, it will grow long and lanky even if the light has lots of blue because it’s “reaching” for more light. On the flip side, if you give your plant high levels of light with lots of yellow, it tends to stay short because it’s getting so much light that there’s enough blue and no need to get taller. Since almost all grow lights give off a spectrum of light that is suitable to healthy cannabis growth, in many ways the amount of light has a much bigger effect on your plant than spectrum. The best way to increase yields is to give your plant more light altogether! In other words, giving your plant more light is going to give you a bigger return on yields than simply changing the spectrum. So if it’s possible to give your plant more light (up to a point), that is going to increase your yields even if you’re adding light in the “wrong” spectrum. Even bright white fluorescents that dip into the green spectrum will produce great plant growth. If it’s a grow light, it will do the job! 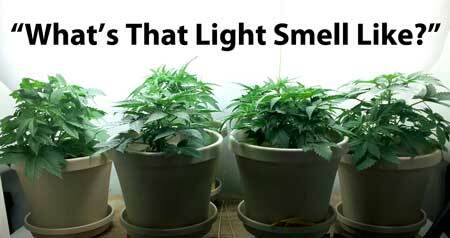 Learn about different cannabis grow lights! 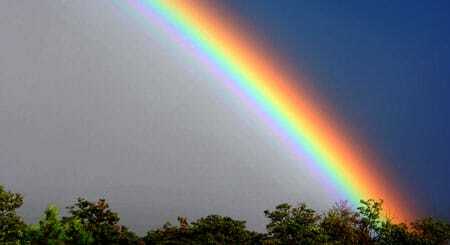 Light is part of the electromagnetic spectrum, which includes not just the visible light spectrum, but also includes X-rays, Gamma rays and infrared light. Plants react to light spectrum via a process (known as photomorphogenesis) that is completely separate from photosynthesis. This section has nothing to do with PAR or lumens or how a plant makes energy from light (which I talk about below). In this section we’re only talking about how the plant uses hidden information contained in the spectrum of light to grow better! Although a plant can’t physically get up and move to a new spot, it is constantly growing and changing its growth patterns to maximize the amount of light it gets. For example a plant turns its leaf blades to face the light as the sun moves across the sky, and then puts all its leaves down at night to save energy and protect itself. Like all plants, a cannabis plant has ways to measure different spectrums of light, each giving the plant information about the best way to grow. Plants “smell” the light spectrum! Like humans, plants use the signals from their senses to help find energy to grow. For example we have a nose to smell something tasty and help us seek out food. But although we use our noses to capture the hidden messages in smells, ultimately a nose can only signal to us about possible food sources. We can’t actually eat food with our noses – we need our mouths to get food in our bellies. Plants have certain light sensors (photoreceptors) found all over the plant that act kind of like the plant’s “nose” to detect information about the light spectrum. Just like how humans use their sense of smell to help find good food, the plant uses the information about light spectrum to help the plant grow in a way that gets the most light. However, similar to how we can’t actually eat food with our noses, plants can’t make energy from light using their photoreceptors. So when it comes to this section about photoreceptors and the light color response of plants, we’re talking about the “nose” of the plant, not the “mouth!” The reactions to light spectrum we talk about below are completely separate from photosynthesis! If you’re interested in how the plant actually obtains energy from light via photosynthesis, check out the section at the end of this page about PAR, lumens and light intensity. Jump straight to the section that interests you! You may be familiar with the term UV-A/UV-B when it comes to protecting your skin outdoors. We use sunscreen to protect our skin from UV rays from the sun in order to prevent skin damage. Too much UV exposure can give you sunburn now, and even carcinoma/melanoma in extreme cases! When we’re talking about plants, UV-A (315 to 400 nm) and UV-B (280 to 315 nm) are sometimes classified as part of the “blue” light spectrum, though in the last several years, we’ve discovered the UV spectrum has its own unique effects on plants. Like humans, plants given too high levels of UV light become damaged, and we’ve learned that plants react to UV rays by making chemicals, antioxidants and enzymes to help prevent and repair damage. Basically, they’re making their own “sunscreen!” It’s a little bit like how our body gives us a tan after UV exposure to protect us from further skin damage. Some growers believe that providing UV-B light to plants may increase the THC levels or some other aspect of potency of cannabis buds. Theoretically, it’s definitely possible since we know that UV-B light does change how plants grow. But what we don’t know is exactly how cannabis responds to UV-B exposure. It’s possible that it increases the levels of THC, but it’s also possible it reduces it, or doesn’t affect THC at all! With what little information we have today, it’s hard to know whether supplementing cannabis with additional UV-B is actually beneficial. That being said, most grow lights naturally produce some amount of UV rays, though far less than the sun. The exception is LED grow lights with narrow-band spectrums which need UV diodes specifically put in. There are other sources of UV light you can get such as reptile lamps. LED grow lights are also a good choice if you want to supplement above normal levels of UV, but you need to make sure you get one that has been designed to produce UV light since that isn’t standard. 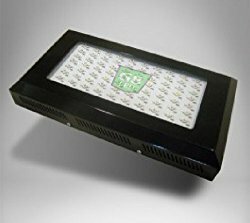 There are new LED grow lights on the market that contain UVB, including this one which also contains light in the infrared spectrum. Although we know that UVB has an effect on cannabis, we don’t know exactly what changes, and whether it’s good, bad or a waste of time! Blue light is very important. Without at least some amount of blue light, most plants won’t grow normally. The plant has several different ways it measures blue light, and they each have their own effects. For example, when you see a plant growing towards the light, it’s actually only responding to just the blue light. Without any blue, the plant wouldn’t know where to grow! Blue light also has an effect on how stems and leaves tend to grow. Seedlings and plants given plenty of blue light tend to stay short, with short stems and squat growth. They tend to grow big leaves and spread them out. 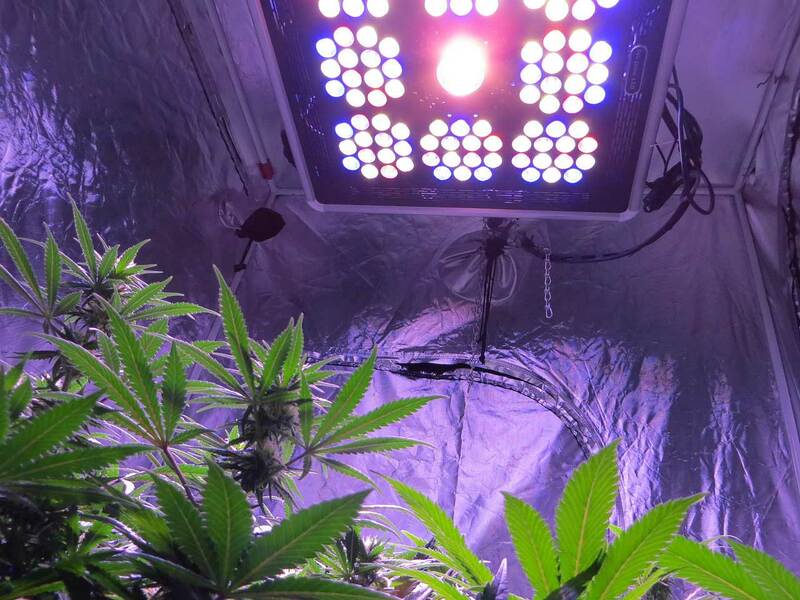 It’s often recommended for cannabis growers to use bright white fluorescents or metal halide grow lights during the vegetative stage since the extra levels of blue help keep young plants from growing tall and lanky, and encourages lots of leafy growth. Blue light also works together with red light to help the plant “know” whether it’s day or night time, and help set circadian rhythms. 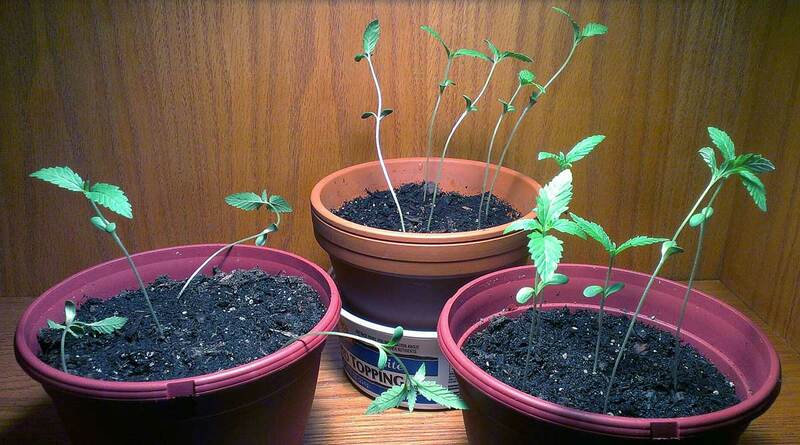 You may notice that cannabis plants start drooping right before the lights go off each day, and they start perking up right when lights come on. This is a way for the plant to save energy while it’s “sleeping.” Since the blue in the light helps it “know” the time schedule, it will prepare as best it can for lights-out and lights-on. There has been quite a bit of research on how different spectrums affect plant growth, especially over the last decade by researchers at NASA trying to find a way to grow plants most efficiently in space with LED grow lights. We have long known that plants need at least red and blue light to grow normally, but recent discoveries have found that green light, while not the most efficient spectrum for photosynthesis, has a significant effect on how plants grow. Green light has been shown to be involved in seedling and vegetative development, the initiation of the flowering stage, CO2/water usage, stem growth and overall plant height. There’s probably more we don’t know about yet! But like the other spectrums, plants seem to want just the right amount of green light for the best growth, not too much or not too little. After many experiments with green light, the NASA Biological Sciences research group has reported that light sources consisting of primarily green will cause plants to grow slower. However, combinations of red and blue including up to 24% green actually enhanced growth for some plants over purely red and blue light. So we’re learning that green is really important! In fact, in one experiment NASA did with lettuce, giving plants only blue/green/red light produced higher yields than full spectrum grow lights! But cannabis is definitely not the same as lettuce and it doesn’t necessarily mean that adding green light will increase your cannabis yields! Nearly all grow lights provide some amount of green and it seems like adding too much green probably would hurt yields. But getting enhanced growth from green lighting is something to explore, especially for LED growers who often don’t give any green at all! Note: There’s plenty of evidence that different types of plants respond to green light differently, so make sure you take any light spectrum study with a grain of salt! In addition to the effects on how a plant grows, green light is what make plants appear natural and green to us. 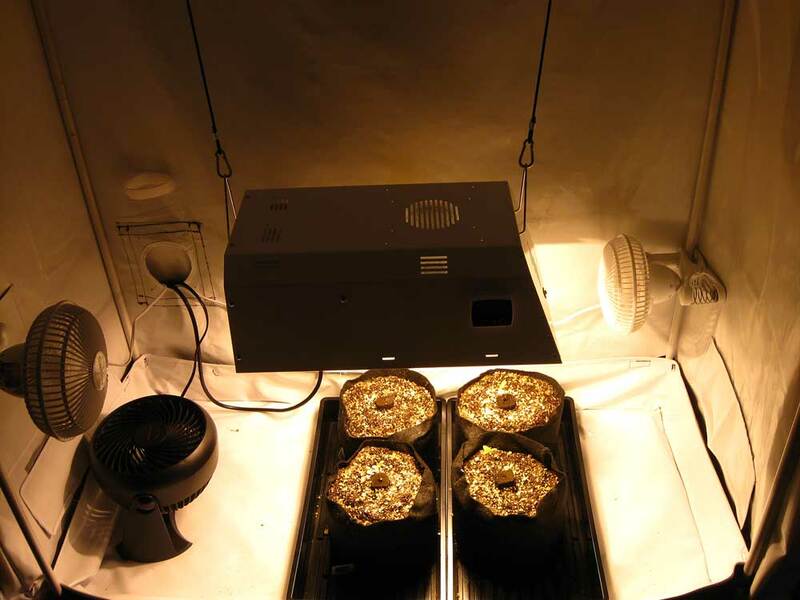 Plants under LED grow lights with just red and blue light tend to look dark or purple similar to how plants look very yellow/gold under a HPS. By adding a little bit of green we can actually see the natural color of leaves, which makes it a lot easier to spot problems! Leaves appear dark under LEDs that don’t have any green diodes. In the picture below, leaves appear purple except in the front where a little bit of natural light coming from outside the tent. You actually see the leaves’ true green color wherever it’s touched by light that contains green. Neat fact! Although your plant can respond to green light in some ways, it can’t “see” green when it comes to photoperiods and knowing when it’s day or night. So you can actually use green light to look at your plants in the dark and it won’t interrupt their dark period at all! Use green light to check on plants in the dark so you don’t disturb their sleep! We can see red light of course, but generally humans can’t see far-red (infrared) light, although we can feel it as heat. Plants, on the other hand, can sense both red and far-red light. Red light is probably the most important type of light for plants. When it comes to photosynthesis, plants are best able to make energy out of red light. In fact, many plants can actually grow even if they only get pure red light, though they won’t grow as big or as healthy as they do under full spectrum light. 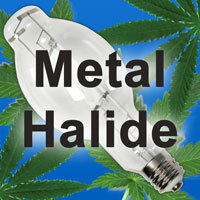 Every type of grow light, even ones that are rich in blue like metal halides, provide quite a bit of red light. However, when it comes to red and far-red light as far as signals (not photosynthesis), it’s not the amount as much as the ratio of red to far-red that’s important to the plant! For the purposes of the plant and its response to light spectrum, red light is ~660nm and far-red light is ~730nm on the light color spectrum. 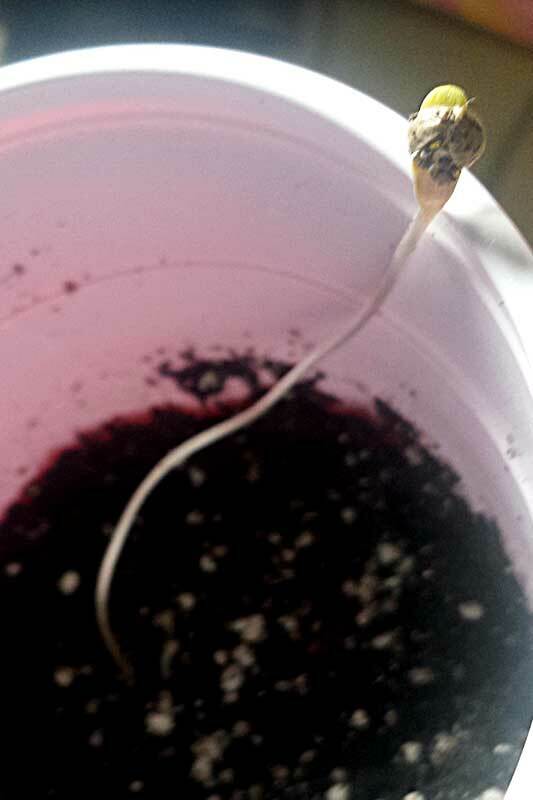 After a seed cracks open its shell, but before it makes it to the surface, the root goes down and the seed grows in the direction of greater levels of red light compared to far red. Blue light doesn’t usually make it underground, but the seed can sense red from the surface, and grows in that direction. 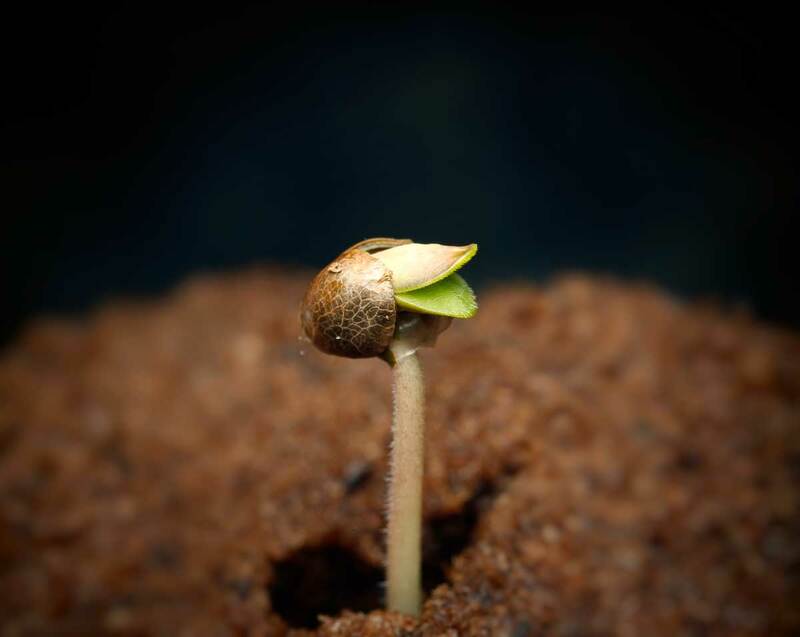 Once the seed reaches the surface and gets exposed to blue light, it stops acting like a root and starts acting more like a seedling, opening its leaves and growing towards the closest source of blue light. If it doesn’t get a good amount of blue light at the surface, it continues to grow its main stem longer and longer without making any leaves, acting more like a root than a plant because it still “thinks” it’s underground, or at least hidden from the sun. Seeds move toward the light, and the leaves inside don’t open up once the plant hits the surface…it’s looking for the right amount of the right color of light! In bright sunlight, a cannabis plant tends to grow short and squat. This is because direct sunlight usually has more red than far-red and the plant reacts to this ratio. So if a plant is getting more 660nm than 730nm light, the stems tend to stay short and the plant grows a lot of nodes with shorter stems. On the flip side, if a plant is getting a more 730nm light than 660nm, it tends to grow tall and stretchy. This is because, in the wild, when a plant is surrounded by a lot of vegetation, the surrounding leaves absorb a lot of the red light, and so whatever light does filter down to the hidden plant or stem has a much higher ratio of far-red light. In response to higher levels of far-red light, stems will start to elongate and grow taller, as the plant is “stretching” up towards the light until it gets a ratio with more red and “senses” it’s in direct sunlight again. You’ve seen red light at sunset. 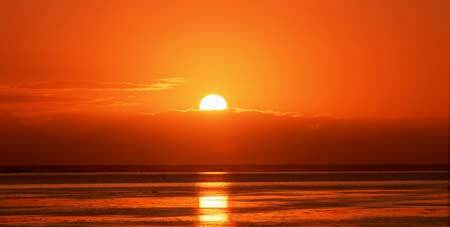 The reason you see red when the sun is on the horizon is because red light has the longest wavelengths, which travel the furthest. At sunset the light is fading quickly, and when all other light is too weak to see, you can still see the red coming through the horizon before it disappears too. Infrared light has even longer wavelengths, so it hangs on just a little bit longer. 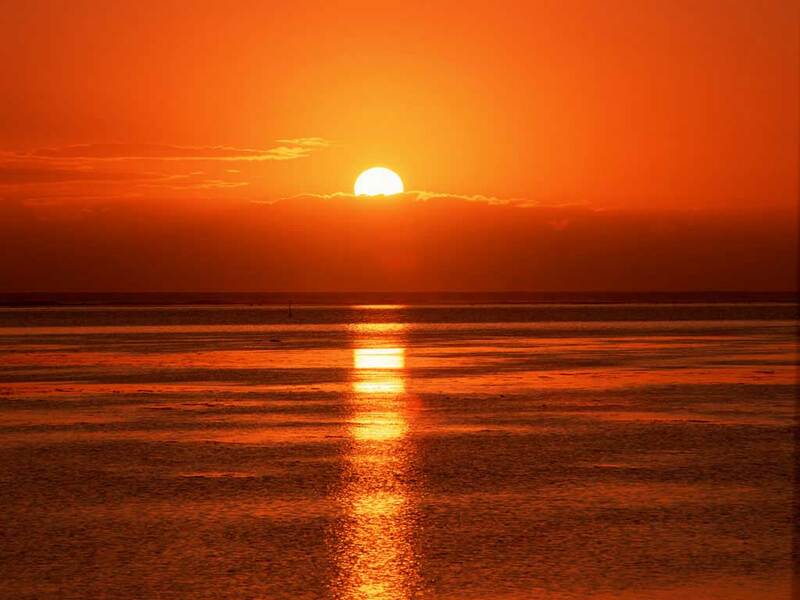 That means for the plant, the highest ratio of far-red light occurs at sunrise and sunset. The information contained in the light is important to a plant because it needs to be able to “know” whether it’s the beginning or end of the day. A plant can take advantage of the light spectrum information to keep track of day and night by sensing when there’s the highest ratio of far-red light. Far-red light is the last thing a plant “sees” at sunset, so when there are high far-red levels followed by a period of darkness the plant “knows” that it’s nighttime. When a plant starts getting higher levels of red light combined with blue from the morning sun, it “knows” that the day has started again. If a plant is exposed to red light during the dark period, it will “wake it up” because it thinks day is happening. Blue light also affects the plant at night by messing up its circadian rhythms, though blue light alone likely won’t stop the plant from flowering. 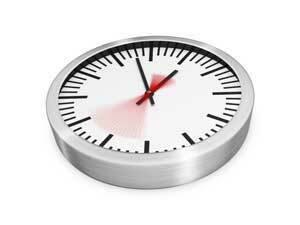 These processes helps the plant set itself on an internal clock. 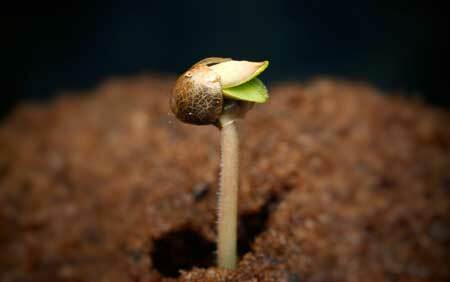 Keeping track of the length of nights is the main way a cannabis plant knows when to start flowering (making buds). When nights get long, it initiates the flowering response because it “thinks” winter is coming! So growers are able to force the plant to start flowering at any time just by changing the plant’s light schedules! Note: Even if the plant doesn’t get far-red light before dark, it will eventually “realize” it’s night time, but it starts the clock 1-2 hours later because it didn’t get that far-red “sunset” signal. Because of this, there’s some evidence that if you provide a plant with a burst of far-red light right before it goes to sleep in the flowering stage, you could cut 1-2 hours off your night period and it wouldn’t interrupt the flowering cycle. That being said, it’s always a good idea to give your flowering cannabis plant at least 12 hours of uninterrupted darkness every night to make sure budding goes smoothly! When time schedules get weird, you sometimes end up getting hermies or have your plant revert back to the vegetative stage, which most growers don’t want! 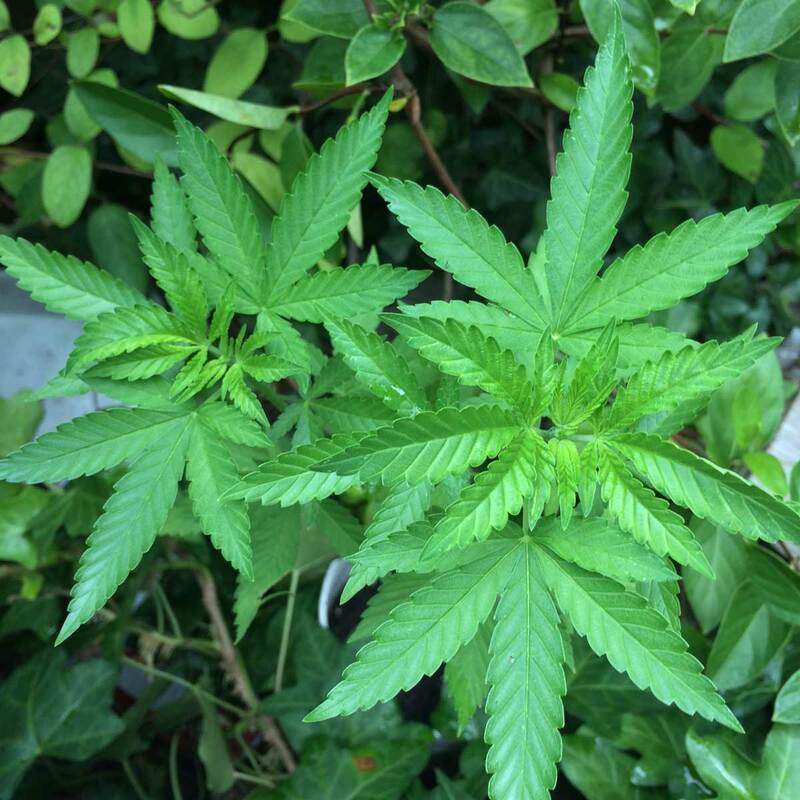 Can I use a thermal imaging camera to watch over cannabis my plants at night? Yes. The way a thermal camera (also called an infrared camera, or thermographic camera) works is it actually absorbs/measures how much infrared light is being given off by objects. A thermal camera works by showing warmer objects as lighter colors. So for example, the cold ground will appear dark, while a plant is a little warmer and will appear lighter. A human is warmer still and appears almost white on such a camera. A thermal (infrared) camera doesn’t actually give off any light, it only measures it. So although far-red light does have an effect on plants, it won’t be affected by a camera that doesn’t produce any. However, if your camera has a screen, the light from the screen is definitely an unwanted source of light! We’ve learned that spectrum can change how a plant grows. So it’s definitely a good idea to try to match the spectrum with your goals, but what do you do when you can only get one light and must choose between one spectrum or the other? If you have to choose between one or the other, it’s generally recommended to use the flowering light spectrum (more red) for the whole grow. This results in bigger yields watt-for-watt. 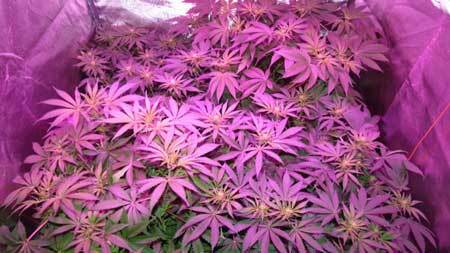 However, you can successfully grow buds in the blue light spectrum for the whole grow, and many growers do this with excellent results. Some growers even claim they like their quality better under blue lights! In other words, color spectrum is important, but it won’t make or break your grow. Note: I’ve used all types of grow lights during all stages of growing marijuana, and even when you’re not using the “right” color spectrum, you will still produce potent buds with any strong grow light! I’ve even used “bright white” CFL grow lights (which have high levels of green), and you may be surprised to learn that these work great for growing weed, too! The color spectrum of your grow lights does affect how a plant develops, but color spectrum won’t make or break your grow! Light energy is what matters most when it comes to cannabis growth rates and yields. Your plant turns light into sugars via the process of photosynthesis, and it’s these sugars that it uses to power the growth of the plant and especially the buds! When it comes to photosynthesis and yields, as long as you’re using a grow light, the most important thing is pure power of light. Because of this, one of the best ways to increase your yields is to increase the amount of light your plant gets. Learn more about the different kinds of marijuana grow lights for indoor growers. PAR vs Lumens: Which is Best to Measure Grow Light Intensity? When it comes to measuring how “good” a grow light is, or how much light it’s producing for your plants, it can get confusing because a lot of terms get thrown around willy-nilly. The truth is that there is no one best way to measure light, but there are several ways and each has their own strengths and weaknesses. One of the most common ways you’ll see light measured is with lumens. Lumens measure “luminous flux” which is a fancy way of saying that it’s how much light you can see as a person. It measures how “bright” something is to human eyes, and it’s weighted so that light we see counts more than the light we don’t see as well. The amount of light received at a particular point in space is known as lux, or lumens per square meter (1 lumen/m2 = 1 lux). When it comes to plants, the type of light we can see, and the type of light they can use are pretty close. So even though lumens don’t measure light exactly as a plant sees it, it does give us a good general idea of how bright a light is to plants for many types of grow lights. Not perfect, but a good ballpark figure. For example lumens are a pretty great way to compare the amount of light put out by fluorescent lights, CFLs, HIDs, MH and HPS grow lights. However, when it comes to LED grow lights, lumens are not as a good measure anymore since LEDs usually give off light only in very narrow wavebands of light, and the weighted numbers from lumens aren’t as good a way to predict how much usable light is getting sent to the plants. Instead of considering how much light is produced from a light source as humans see it, PAR actually considers only the spectral range of solar radiation from 400 to 700nm, which is the spectra of light that plants can use for photosynthesis. It’s pretty close to the range of light that humans can see, but not quite. There is a lot of confusion about this term! PAR is actually just a way to talk about the spectrum of light between 400-700nm. It doesn’t actually measure anything. When people are talking about “the amount of PAR a grow light gives off,” they’re actually talking about how much light in the PAR range that a light is giving off, or PPFD (Photosynthetic Photon Flux Density, sometimes abbreviated PPF). So when most people talk about PAR, they’re actually talking about “PPFD” or how much light is getting sent that can be used for photosynthesis. When scientists and plant biologists are measuring how much light is being produced for a plant in experiments with light spectrum, they almost always measure in PPFD. Plants are more efficient at producing energy from light in some parts of the PAR spectrum than others. For example, we know that plants are most efficient at photosynthesis when using light in the red and blue range. This is why you see graphics like this when people are talking about PAR. 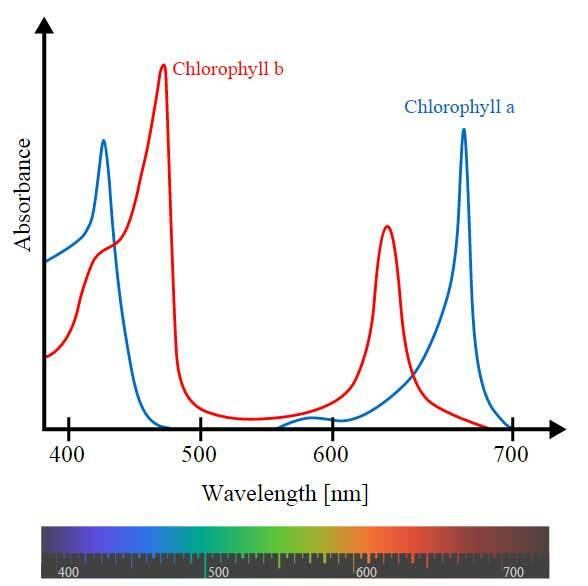 This measures how well each type of chlorophyll in plants is able to absorb energy from light at different parts of the PAR spectrum. However, it’s important to note that cannabis plants can photosynthesize light from all parts of the spectrum, including in the green section as you can see in the graphic above, even if a plant doesn’t absorb energy from all types of light evenly. 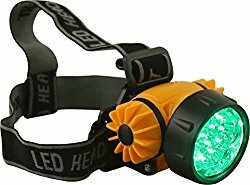 One way green light is helpful is it penetrates further down into the canopy than red and blue light, which get mostly absorbed by the upper leaves. This adds to amount of photosynthesis happening to leaves further down on the plant. Additionally, since the spectrum of light also has an effect on how plants grow in ways that are completely separate from photosynthesis (as explained in this article), you probably wouldn’t get the best results focusing only on only photosynthesis anyway! As has been demonstrated by NASA and others, many plants grow more healthfully and faster when they also receive at least a little (not too much!) light from the green section, even though it’s not the most efficient light for photosynthesis. 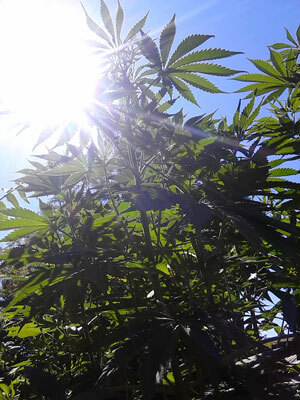 As you’ve read today, cannabis uses many aspects of light to develop into the bud-bearing plants we love! Instead of focusing on any one aspect, it’s important to look at your results as a whole! Power is more important than spectrum – the total amount of light given is a lot more important to growth than spectrum! As long as you start with a great cannabis grow light, you don’t really need to worry about spectrum! Always train your plants to get the most out of your grow light (up to 40% more yields under the same grow light compared to not training) or if you’re still having trouble reaching your yield goals, upgrade to a bigger light! I hope that helps you cut through all the conflicting information and gives you the information you need to make the right choices for your cannabis garden! Photosynthesis – The process of capturing energy from light to produce sugars in the plant to power growth! The amount of light (often measured in lumens or PAR/PPFD) is directly related to how fast a plant grows!